Learn how to market yourself with our downloadable marketing assistant cover letter sample and expert writing tips! Or, if you want a shortcut, try our easy-to-use cover letter builder. 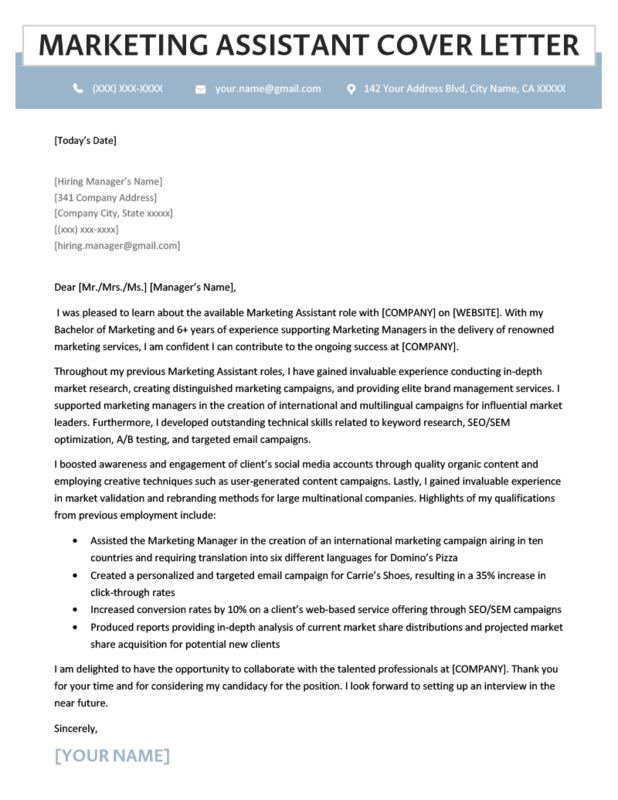 I was pleased to learn about the available Marketing Assistant role with [COMPANY] on [WEBSITE]. With my Bachelor of Marketing and four years of experience supporting Marketing Managers in the delivery of renowned marketing services, I am confident I can contribute to the ongoing success at [COMPANY]. Throughout my previous Marketing Assistant roles, I have gained invaluable experience conducting in-depth market research, creating distinguished marketing campaigns, and providing elite brand management services. I supported marketing managers in the creation of international and multilingual campaigns for influential market leaders. Furthermore, I developed outstanding technical skills related to keyword research, SEO/SEM optimization, A/B testing, and targeted email campaigns. I boosted awareness and engagement of client’s social media accounts through quality organic content and employing creative techniques such as user-generated content campaigns. Lastly, I gained invaluable experience in market validation and rebranding methods for large multinational companies. I am delighted to have the opportunity to collaborate with the talented professionals at [COMPANY]. Thank you for your time and for considering my candidacy for the position. I look forward to setting up an interview in the near future. As a marketing assistant, you are an expert at crafting content that will engender a sense of trust, promote exposure, and generate reputability. Your cover letter is your opportunity to do just that for your marketing assistant abilities — think of it as your very own personal marketing campaign! You know how important it is to capture an audience’s attention, make a lasting first impression, and provide them with a clear call-to-action. But, you find yourself uncertain of how to let your personal brand shine through a bland, generic document like a cover letter. Luckily, you’ve come to the perfect place — our cover letter expertise mixed with your persuasive marketing prowess will have a hiring manager calling you for an interview ASAP. 1. What is the conversion rate for your cover letter? What is your content’s click-through-rate? How many followers do your social media accounts have? How do you increase the conversion rate? How many participants did your campaign reach? What percentage of the market share do your clients represent? Where does your client fall on Google ratings? You meticulously pour through analytics and use every tracking tool in books to measure the results of your marketing efforts. Luckily, this quantified data is great news for proving your effectiveness as a marketing assistant on your cover letter. Your cover letter should include impressive numerical values that have been produced as a result of your marketing efforts. For instance, watch how including a quantity (bold) adds depth and confidence to this candidate’s cover letter. You wouldn’t leave impressive numerical values proving product or service effectiveness off of a marketing campaign — so why would you exclude them from your cover letter? A day in the life of any marketing professional requires an abundance of different marketing programs and tools. The hiring manager is undoubtedly on the hunt for a marketing assistant that is well-versed in the industry-specific technologies. Therefore, it is crucial that your cover letter tells the hiring manager where your technical expertise lies. Check out the job description for a list of the tools the company would like the ideal candidate to be familiar with. But don’t sweat it if your technical skills aren’t a perfect match — there are too many programs out there to be familiar with, regardless of how extensive your experience is. I developed outstanding technical skills related to keyword research, SEO/SEM optimization, A/B testing, and targeted email campaigns. Additionally, this is a great way to ensure that your application breezes through an Applicant Tracking System (ATS). This is a application reading robot that scans your documents for keywords and phrases identified by a hiring manager. If your application includes a high enough volume of keywords, then it will speed through the system and be passed on to the hiring manager for review. If not, it has earned a quick trip to the company recycling bin. Program names and tools are likely to have been identified as keywords by the hiring manager, and are therefore your winning lottery numbers where ATS are concerned. What more information on how to arm yourself against Applicant Tracking Systems? We have a full guide on how to beat the resume reading robots for you to read today. 3. Spelling and grammar matter. Period. It’s your worst nightmare as a marketing assistant — a spelling/grammar error has somehow slipped past all the usual checks and made its way into a marketing campaign. It’s then picked up by Reddit.com users and transformed into a meme in mere minutes. The mistake floods online forums and social media accounts, lasting the entirety of the internet’s attention span, approximately 12-hours, before being archived on a blog post such as Hubspot’s 11 embarrassing spelling and grammar mistakes for brands. Although a mistake such as this provides joy to internet users everywhere, it can be catastrophic for a marketing agency that let the error slip. A hiring manager is using your cover letter as a testing ground for your attention to detail to ensure that the above scenario, or similar incidents, never occur under your watch. Rest assured that if your cover letter is riddled with spelling and grammar errors, a hiring manager is unlikely to invite you for an interview. Therefore, if you want your application to stay out of the recycling bin, you need to make sure it is free of spelling and grammar mistakes. Although a Word spell-check is a great place to start, we suggest having a third party review your cover letter before clicking the “submit” button. If you don’t have any friends who are English buffs, many expert online services are available to review your cover letter and resume. Need some creative designs for your cover letter? Check out our cover letter design library to find the perfect design for you. Alright, excellent work — you’ve covered all of the necessary information and are ready to get started on your marketing assistant cover letter! We can’t wait to marvel at the marketing campaigns you create in your next marketing assistant role. If you have any additional questions, don’t hesitate to leave a comment below and a member of the Resume Genius team will get back to you ASAP.